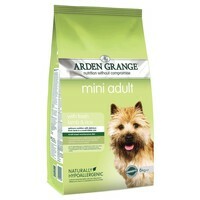 Arden Grange Mini Adult Food (Lamb & Rice) is a complete dry food for miniature, toy and small breed dogs with normal activity levels. Made with delicious, meadow reared lamb as an easily digestible alternative to a chicken based diet, this Arden Grange recipe is particularly suitable for dogs with a sensitive digestion. It is also frequently suited to dogs with an intolerance or allergy to chicken protein. Small Kibble: Suited to smaller breeds with smaller mouths.